A section of the Wisconsin River winds through towering, 500 million-year-old rock formations composed layer upon layer of honey-coloured sandstone. 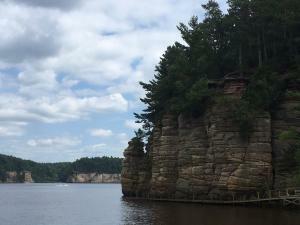 Called the Upper Dells, the cliffs were cut by ancient glaciers. They’re remnants of a time when the continent was covered in desert. During a boat tour meandering around the imposing cliffs and traversing dazzling river narrows, a few dear friends and I marvelled at the protruding rocks that cradle a several-mile stretch of the river. Our guide described how these Cambrian-period rocks are some of the oldest exposed bedrock on Earth, a testament to their strength and endurance. And yet the Dells are essentially created from sand, making them also among the softest rocks in existence. Being incredibly porous, they let water penetrate into them. This enables lush clusters of pine trees to grow supported by deeply embedded roots. The surface is also soft enough for swallows to burrow nests into the sides of the sandstone. The incredible robustness of the Dells paradoxically relies on their delicacy and receptivity, a fitting analogy as I reflect on my journey as a dervish, or disciple, of Mevlevi sufism. It’s been just over a year since I made a public commitment to the path that traces back to Mevlana Jalaluddin Rumi, one of the greatest mystics and poets the world has ever known. This period has marked the most rigorous and transforming spiritual and psychological training I’ve ever undertaken. It’s complicated to describe the subtle realisations that unfold on a personal journey to attain nearness to God. What I can put into words is that, above all else, my heart has become more porous, receptive and tender. The changes in me are both subtle and profound. Rather than simply dropping a pound in the cup of a homeless neighbour as I may have before, I’m more inclined to look them in the eye and ask how they are and what they need. Instead of finding fault in another I deem has wronged me, I pause before reacting to understand their vantage point, not judge them from mine. I’m more merciful with myself, tuning down that once roaring inner critic that constantly questioned my worthiness, intelligence and goodness.